Each day, only 4 out of 10 passengers can get a ride. This gets worse during rainy days and Fridays; at certain hours, only 2 out of 10 will get a ride. You might not see them, but hidden in the crowd is a mom waiting to spend quality time with her child. A tired nurse waiting to get some rest after doing two excruciating shifts. A guy waiting to get to a blind date he might actually never see at all. A worker who can’t work. A parent who can’t parent. A rider who can’t ride. Waiting has become a fact of life to the over 600,000 Filipinos trying to book a ride every single day. With only less than 35,000 drivers active daily, more passengers are getting stranded on the road each day. While regulation is needed to maintain checks and balance, it should be flexible and forward-looking, and should not restrain the industry from progressing further. Unfortunately in Metro Manila, the supply of TNVS cars has been compromised due to regulatory restrictions. LTFRB ordered Grab and other TNVS players to deactivate drivers registered after June 30, 2017. LTFRB set a limit of 45,000 TNVS units across all transportation network companies (TNC) nationwide, less than a third of the 125,000 currently in operation at the time. The LTFRB also said that it would review the common supply base every three months, but has not done so since July 2017. Uber pulled out its operations in Southeast Asia and in the Philippines. About 8,000 cars were not able to transition. 6,000 Uber vehicles were found to be unregistered in LTFRB’s masterlist, and 2,000 vehicle (and their owners) chose not to join Grab. The LTFRB suspended Grab’s legal P2 per minute travel time charge. Drivers incomes were severely affected, causing them to drop out of the system. Online drivers dropped by 6% from April to July 2018, severely affecting the supply situation. 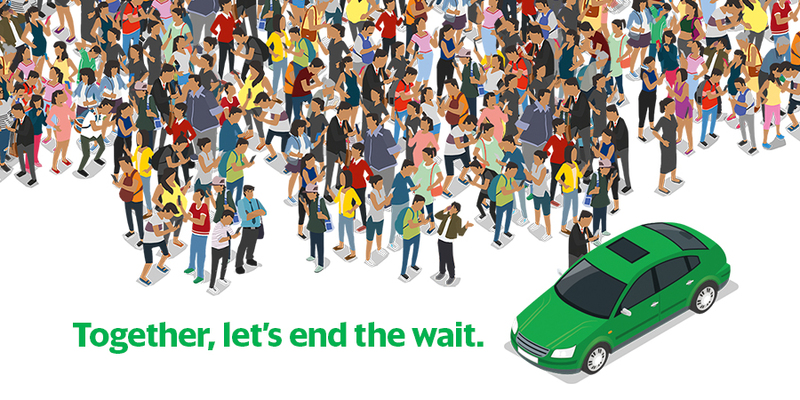 Grab submitted a proposal to LTFRB to increase the limit of cars to at least 80,500, taking into consideration the number of people trying to get a ride everyday. To date, no action has been taken by the LTFRB. Today, there are only 42,000 active vehicles left in the system, with only 35,000 cars operating daily. That’s 35,000 drivers trying to accommodate a demand of 600,000 everyday. Grab and the other TNCs have been asking LTFRB to open the remaining 10,000 slots to increase the supply of cars but LTFRB only took action recently. The board has announced that they will start accepting online registrations to maximize the unutilized 10,000 slots. But will this 10,000 slots be enough to serve the ongoing demand? More importantly, there is NO structural mechanism to replace inactive drivers in the list. About 13,000 slots are not maximized because inactive drivers can’t be replaced with drivers who have been waiting to be accredited. OKAY, WE GET THE SUPPLY CRISIS. BUT WHAT HAS GRAB DONE TO HELP SOLVE IT? Grab has submitted our proposal to LTFRB last June 2018 to increase the limit of cars to at least 80,500, taking into consideration the number of people trying to get a ride everyday. But LTFRB has not taken action yet. In the meantime, we are providing a solution for mobility in congested markets like Metro Manila through Grabshare. By allowing more than two parties to carpool in a car, we are able to maximize the number of seats and bring more passengers to their destinations. SO HOW DO WE #ENDTHEWAIT? Add new cars. LTFRB has just announced that they will open 10,000 new slots, but how fast will this be? Immediate processing of additional slots will help ease the supply problem and help get more people to their destinations. Clean up the existing list. About 13,000 slots are taken by inactive drivers. If utilized and replaced with active drivers waiting to be accredited, they can service more than 150,000 rides daily (average of 12 rides a day per driver) and can help bring more passengers home. Not all drivers are full-time. Some only drive for several hours within the week. 20% on drivers are affected by coding and other needs every day. Demand continuously grows over time as more people download various TNVS apps. 15% of drivers naturally drop-out of the system over time, for various reasons. These drivers will need to get replaced. Erring drivers and operators who are banned from operating a TNVS must also be replaced. TOGETHER, LET’S END THE WAIT. Let your voices be heard. Let’s make it loud enough so that LTFRB will know and understand what we have to go through each day while we wait for our rides. If you have been affected by this supply crisis, share your experiences using #EndTheWait.